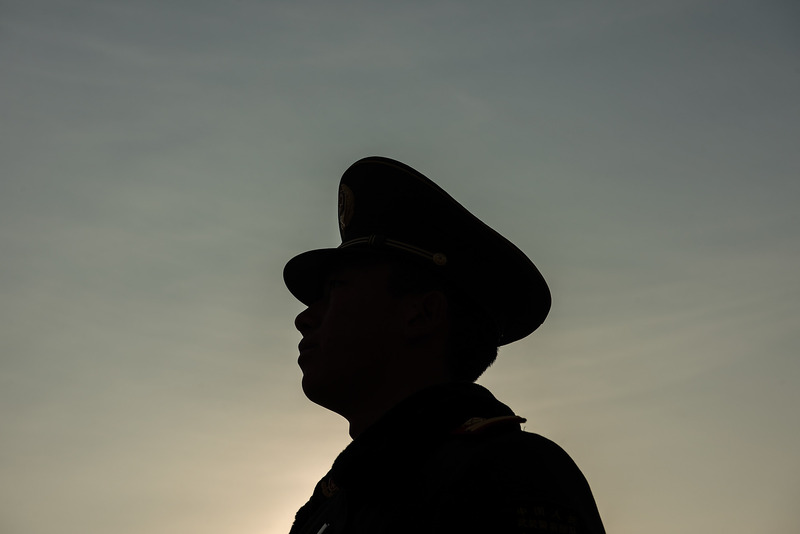 A paramilitary policeman stands guard on Tiananmen Square, in Beijing, March 19, 2018. Update: The China NGO Project has learned that Cheung was the subject of dozens of accusations of sexual harassment in 2018. We do not know if this is in any way connected with his detention. As reported by HK01, a Hong Kong-based news outlet focused on civil society and advocacy work, local public security authorities picked up Hong Kong resident Cheung Kam Hung on January 11 in Shenzhen, Guangdong province for violations of the Foreign NGO Law and administratively detained him for three days. As head of the Hong Kong-registered Rainbow China (彩虹中國), a non-profit focused on LGBT rights and HIV/AIDS prevention and support in China, Cheung had planned to travel to Fujian province on January 12 to conduct activities related to his NGO work. HK01 included a photo of his signed deportation notice, which references China’s Foreign NGO Law. The notice was issued by police in Wuhan, a city hundreds of miles away from both Shenzhen and Fujian and apparently not on Cheung’s itinerary. As far as The China NGO Project is aware, this case, if confirmed, would be the first time the Foreign NGO Law has been formally invoked as the basis for an individual’s administrative detention. The Foreign NGO Law, effective since January 2017, mandates that any foreign non-profit (including organizations registered in Hong Kong) carrying out activities in mainland China must establish a permanent presence there through an approved representative office or file for temporary activities with the assistance of a local Chinese Partner Unit. Either mechanism requires the assent of local security authorities, who are the implementing agency for the law. In several cases over the past two years, observers have wondered whether the Foreign NGO Law might be the basis for the detention of foreign non-profit employees in China. Yet, in none of these previous cases was the Foreign NGO Law formally invoked. Cheung told HK01 that because the Foreign NGO Law prevented him from fundraising in China, he had worked with a domestic NGO to fundraise on Tencent’s online charity platform. He also gave public welfare-related speeches and provided consulting services to mainland universities. (It is unclear whether these activities were connected to Rainbow China, or if Cheung participated in them independently.) Cheung said that because of the Foreign NGO Law, he had intended to disband Rainbow China in the first quarter of this year, after finishing up one final project and completing necessary financial reports. According to the HK01 report, Cheung had planned to travel to Fujian on January 12 to carry out “public welfare activities,” but instead was detained by public security officials who came to his hotel in Shenzhen shortly after he arrived on the evening of January 11. Cheung indicated that he was questioned until the early morning of January 12, at which point authorities said he had violated the Foreign NGO Law and would be administratively detained. Upon his release from detention in Shenzhen on January 15, police gave Cheung a deportation notice, which stated that he is not allowed to enter mainland China for five years. The photo of the deportation notice cites the People’s Republic of China’s Exit and Entry Administration Law (中华人民共和国出境入境管理法) as the mechanism under which Cheung is to be denied entry. Cheung also learned from the notice that it was originally public security authorities in Wuhan who issued the document. It is unclear why Wuhan authorities in particular were involved in this case. Cheung speculated that someone had informed the Wuhan police about his impending trip to China, who then handed the case off to Shenzhen authorities. Cheung further stated he believed that the Foreign NGO Law was possibly not the real reason for his detention, given that until now he had been working without incident in China, but that the law could have provided legal cover to keep him out of the mainland due to his associations with controversial political figures in Hong Kong, his religious beliefs, or his activism related to Tiananmen. This case raises several important questions for international groups seeking to work in China. Does this case represent a period of stricter enforcement of the Foreign NGO Law? If so, some groups may have to rethink what types of activities they are comfortable attempting in the mainland. Any groups that hoped they would be able to work on low-key, small programs without filing for temporary activities may decide that this is no longer a viable strategy. Other groups may wonder if there is a clear boundary between Cheung’s activities and what many foreign NGOs currently consider short of a formal “temporary activity”? For example, might a closed-door meeting with potential partners count as an “activity”? Or, is Cheung’s case the first instance where the Foreign NGO Law is being invoked in lieu of a more serious criminal charge? In the current politically-charged environment, even this possibility may make some international groups wary of working in China, regardless of their registration or filing status.